When you are in Hong Kong, eating dimsum is highly recommended, if not compulsory. 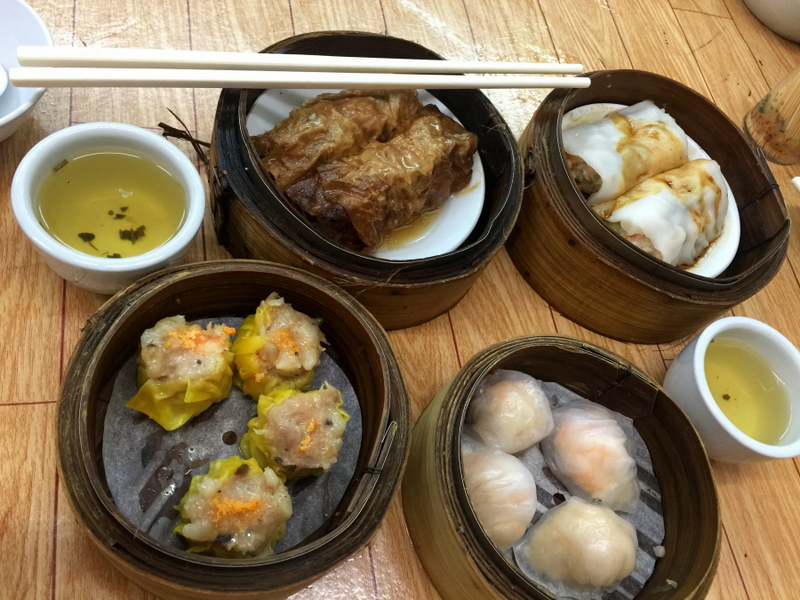 I have read from Miss TamChiak about a dimsum place called Saam Hui Yaat, which is just a few blocks from my hotel at Best Western Harbour View Hotel in Sai Ying Pun. 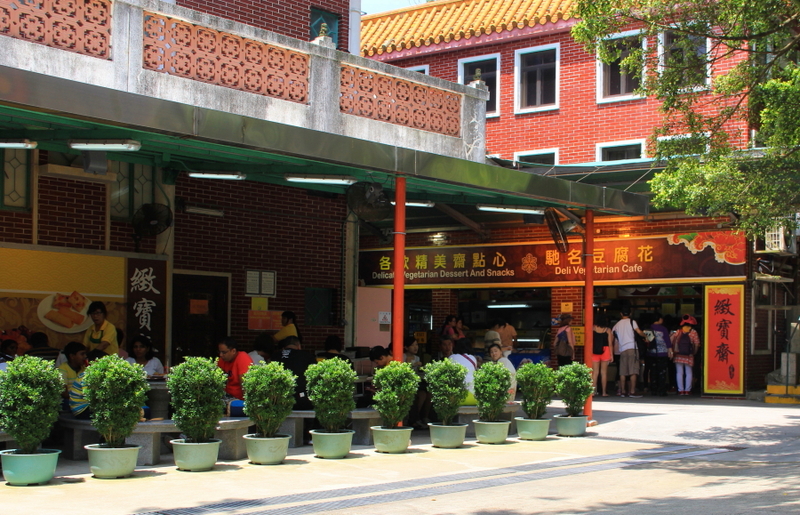 We kicked off our first morning in HK with breakfast at this place. I don’t speak Cantonese so I basically used body language 🙂 We were greeted and seated by an old man, he gave us 2 tea bowls, a kettle of tea for drinking, and a bowl of warm water for washing utensils. 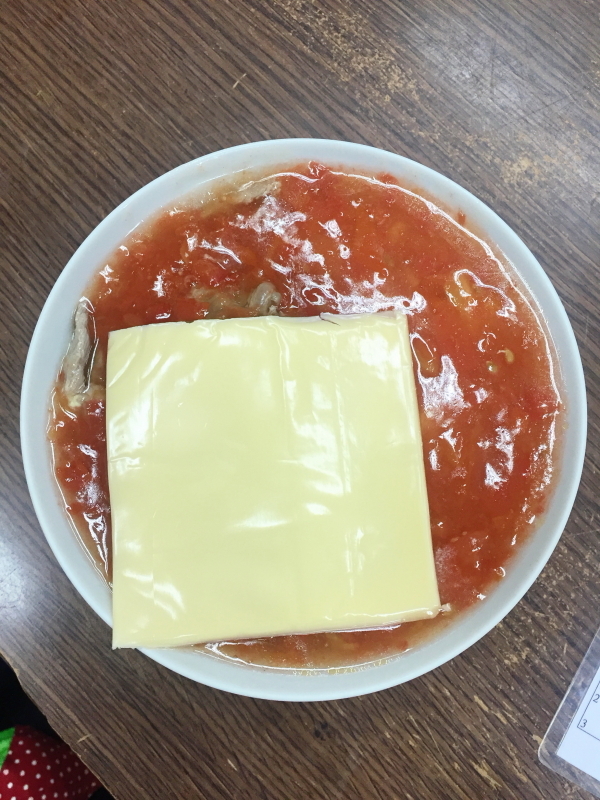 Once settled, I walked to the counter and pointed to the food that I wanted. Then the old man at the counter heated them up and served us not long after. Four plates of dimsum later, we were pretty full. 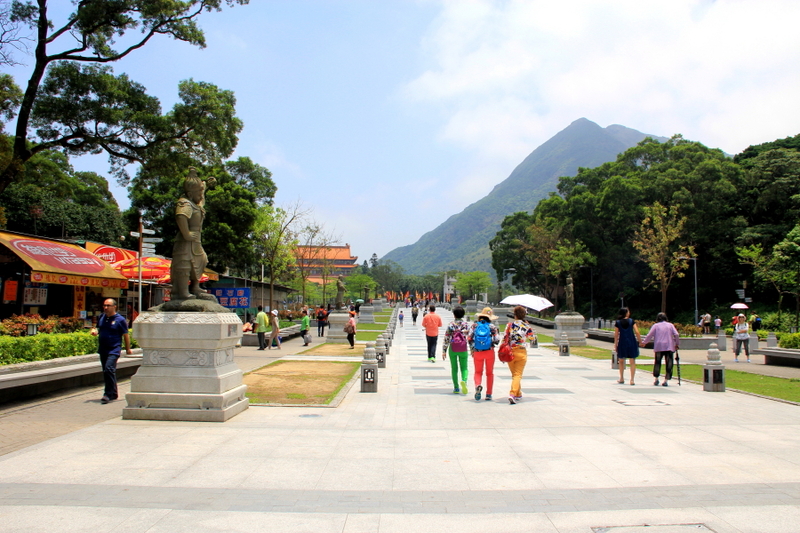 And we set off to our first destination: Lantau Island. 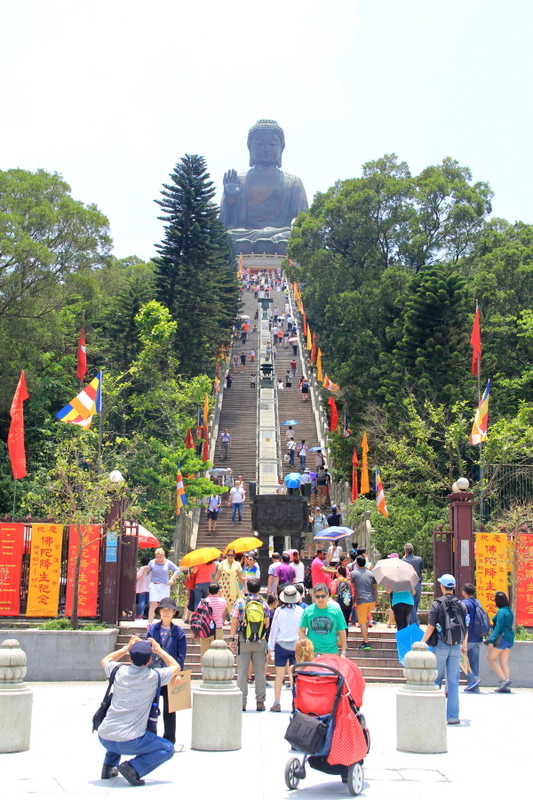 Our initial plan was to do hiking on a segment of Lantau Trail, starting from Pak Kung Au, passing through Lantau Peak (which is 2nd highest peak in HK), followed by Wisdom Path, and finally ending at the Big Buddha in Ngong Ping. This route is suggested by Itishk. However, I got stomach cramp on that day, and my sister was not confident to do such hiking. 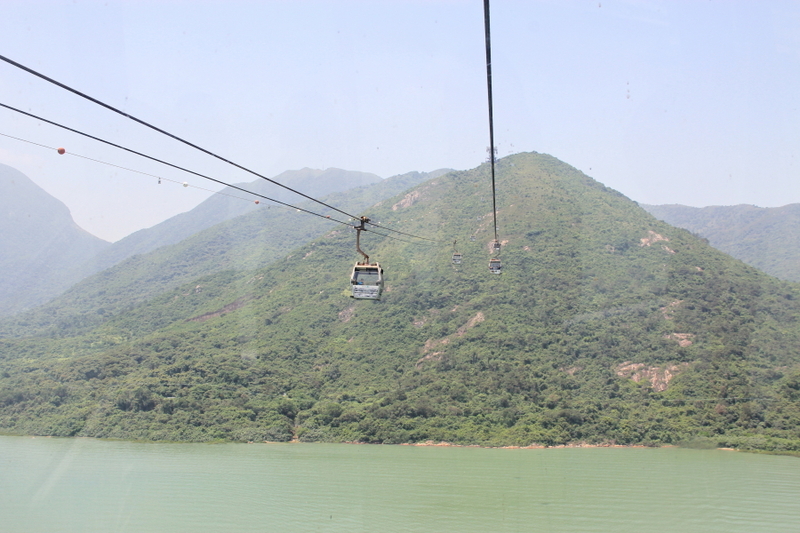 So we took the easy way out: take cable car from Tung Chung MTR to Ngong Ping Village! 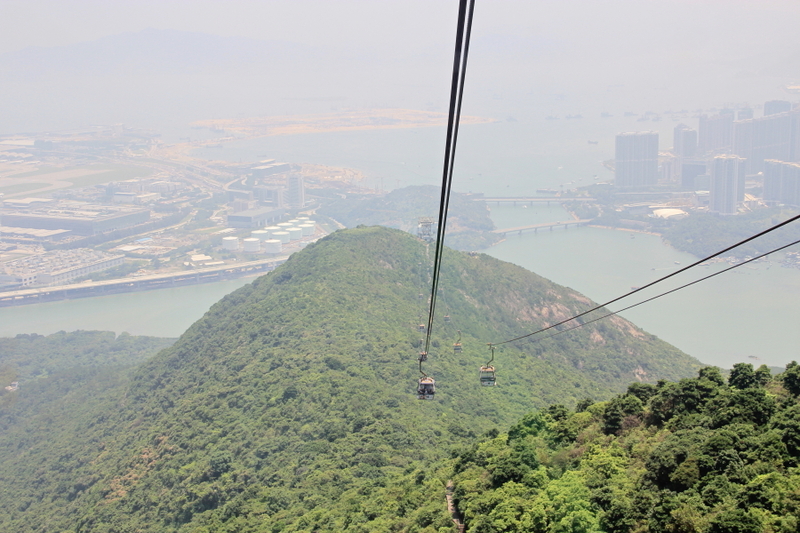 The cable car return trip cost $185 for adult, standard cabin. More details about pricing here. 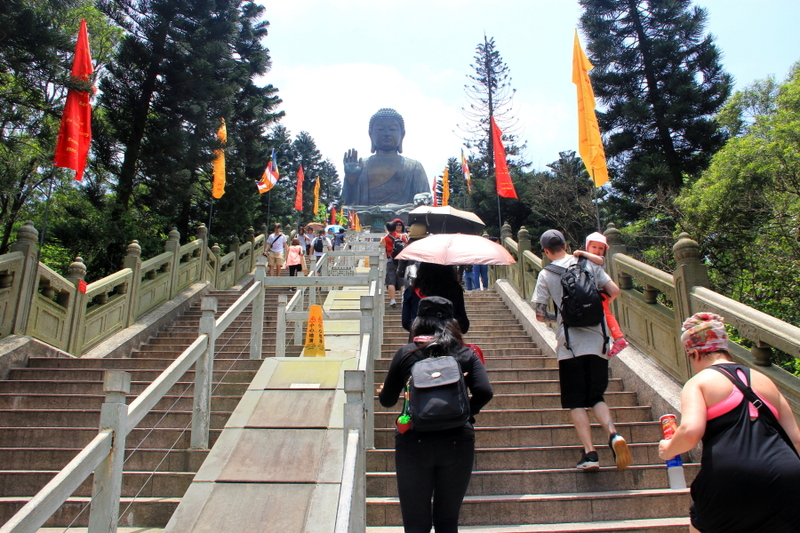 We explored Ngong Ping village, Po Lin Monastery, and climbed the stairs to the Big Buddha. They are all within walking distance, you will not miss it. 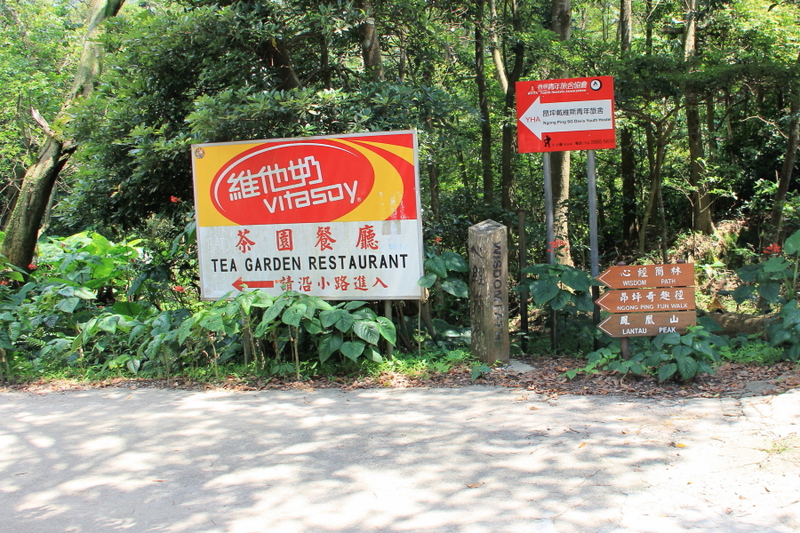 Tired from the exploration, we bought lunch from Deli Vegetarian Cafe just beside Po Lin Monastery. The trick to buying food here is: you must queue from the back of the line even though the item that you want is located at the front of the line. We went straight to the front of the line and nobody served us. Lesson learnt. 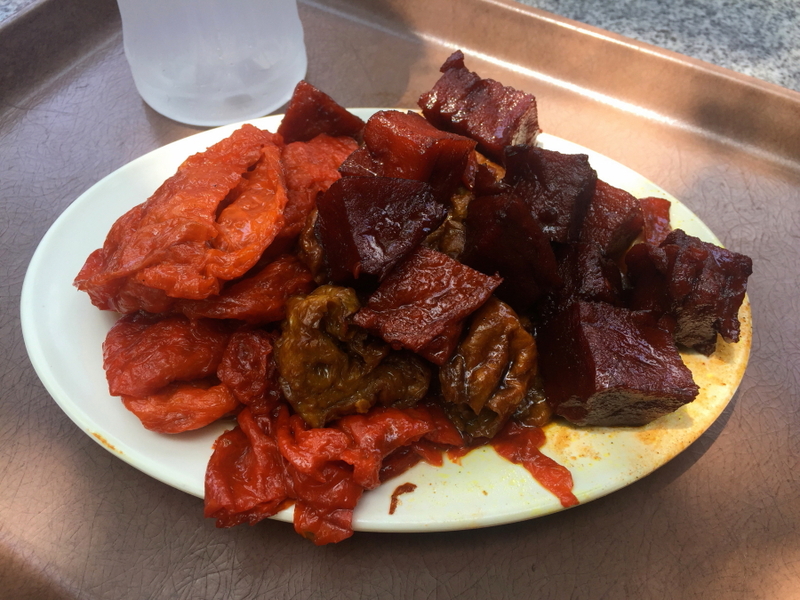 And for the vegetarian main dish, there are 3 types of dishes to choose from, no matter how many types you choose, the total combined portion will be same, so you will pay the same price regardless of how many types of dishes. For me, the food was mediocre and too sweet for my liking. 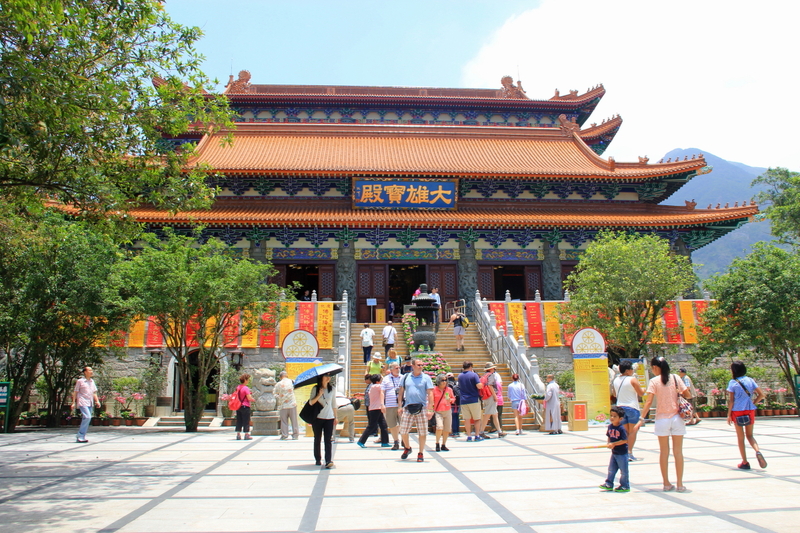 With the newly loaded stomach, we headed to Wisdom Path. 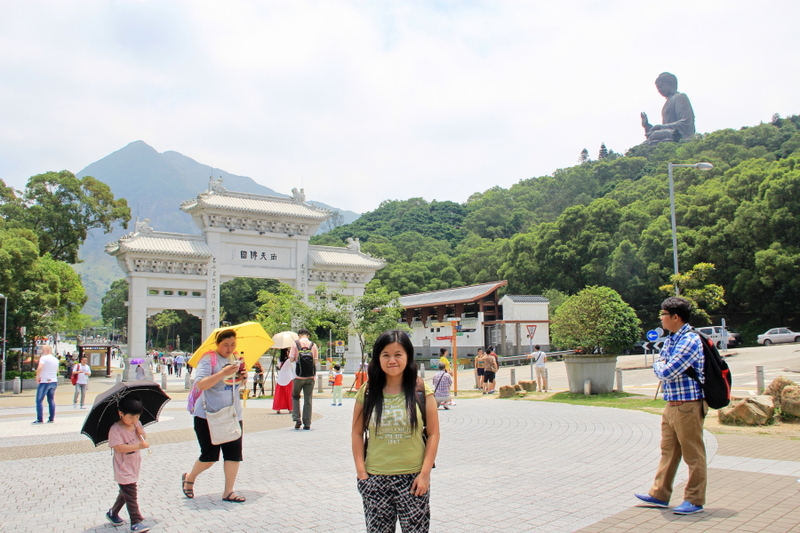 It was probably 10 mins walk from Ngong Ping, but not many people went there. To my surprise, I love it there. 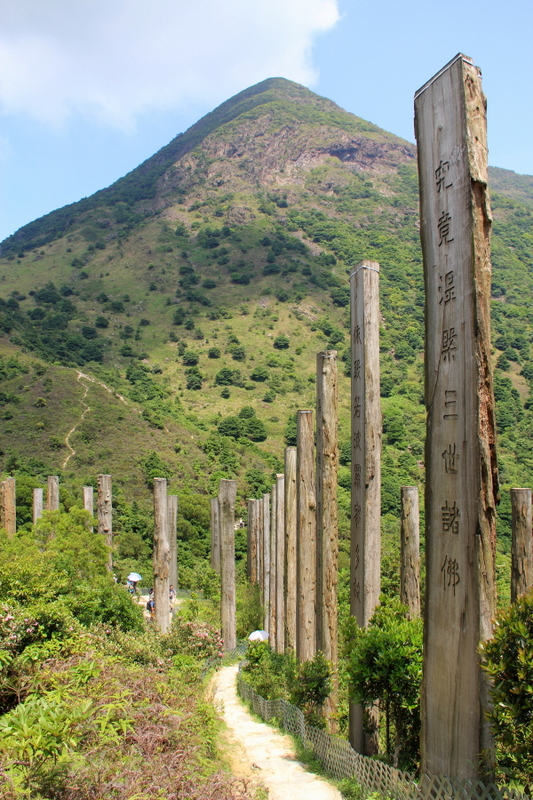 There are plenty vertical wood planks written in Chinese characters, located on the hill. 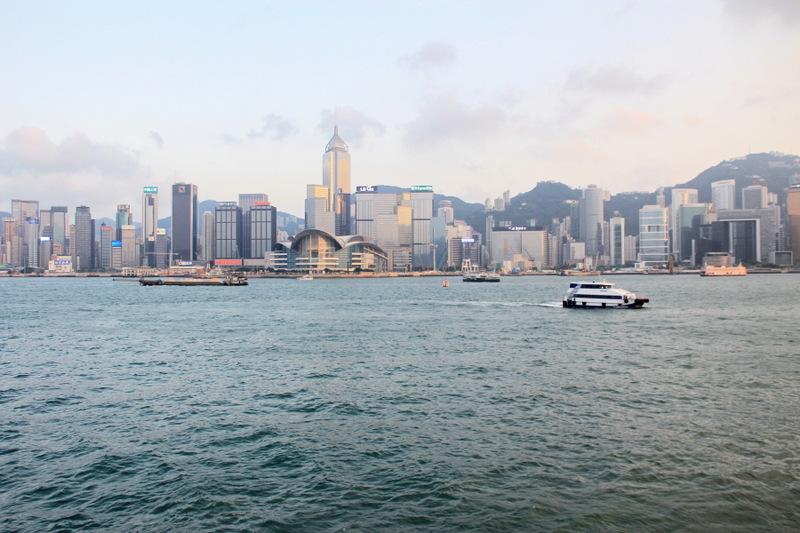 Coupled with Lantau Peak and blue sky as the background, it makes a great photo-shooting location. 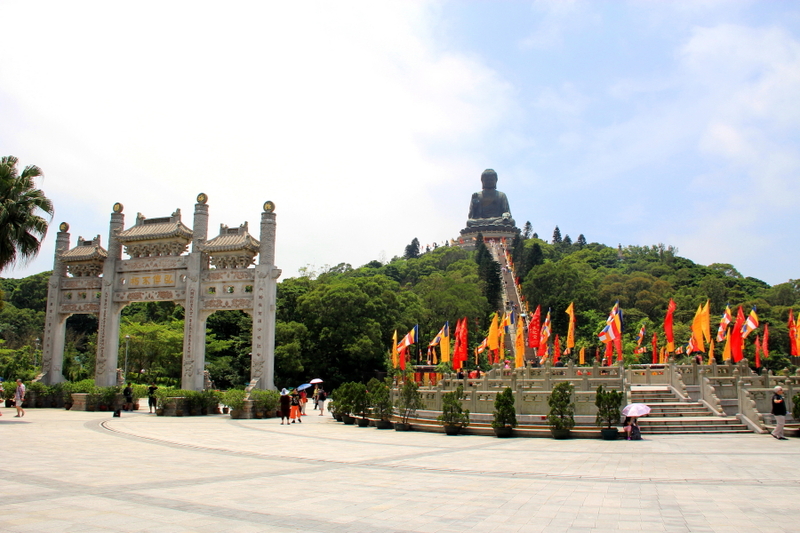 Man, I really love the mountain and wish that I climbed to Lantau Peak. 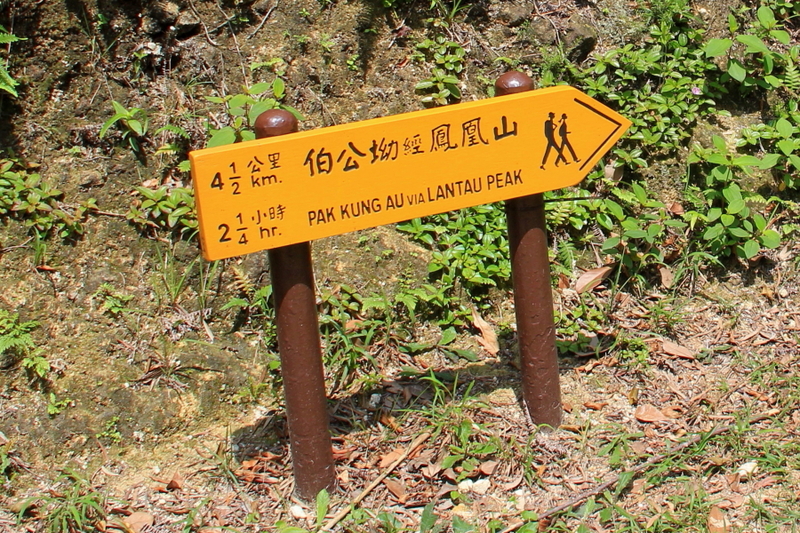 Well, I thought, I should just try to hike Lantau Trail from Wisdom Path and see how far I can go. And I did it! Alone, because my sister was tired and her shoes were kind of damaged. I hiked for about 500m, yay! 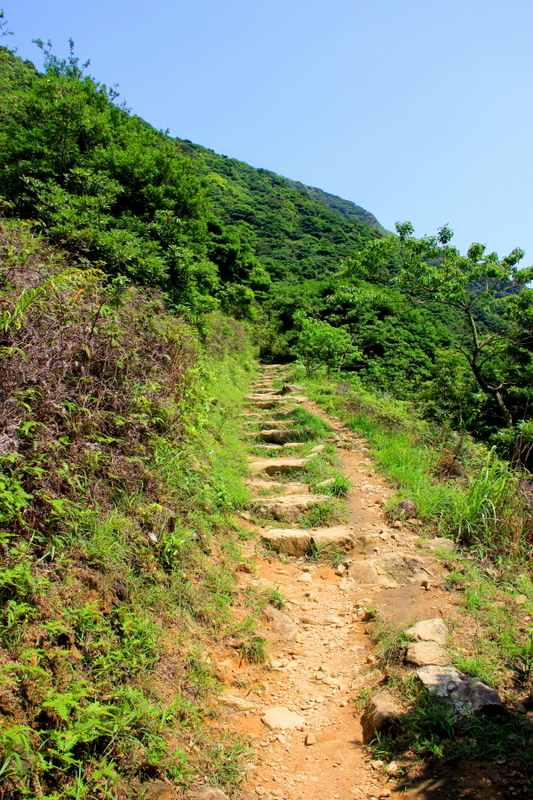 The trail was full of concrete stairs and gravelled paths. The view was great. Without training, I felt my legs were starting to feel like jelly, so I turned back. 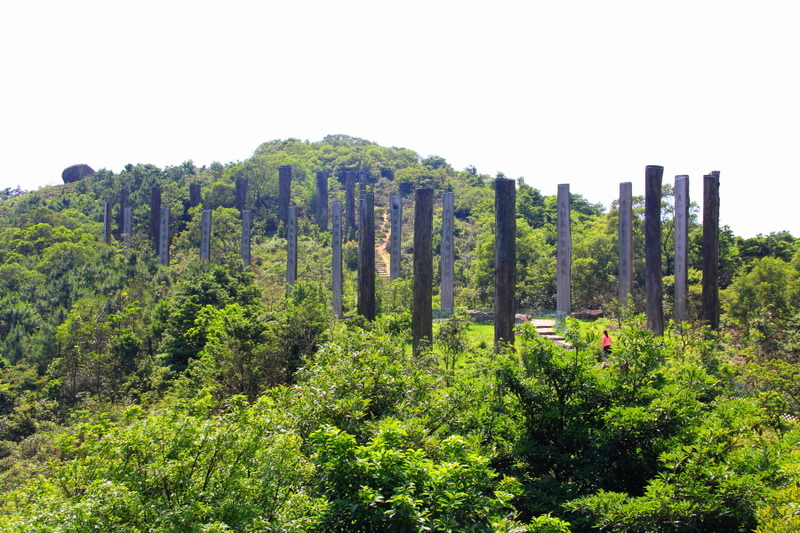 Next time, I’m truly gonna hike this Lantau peak! 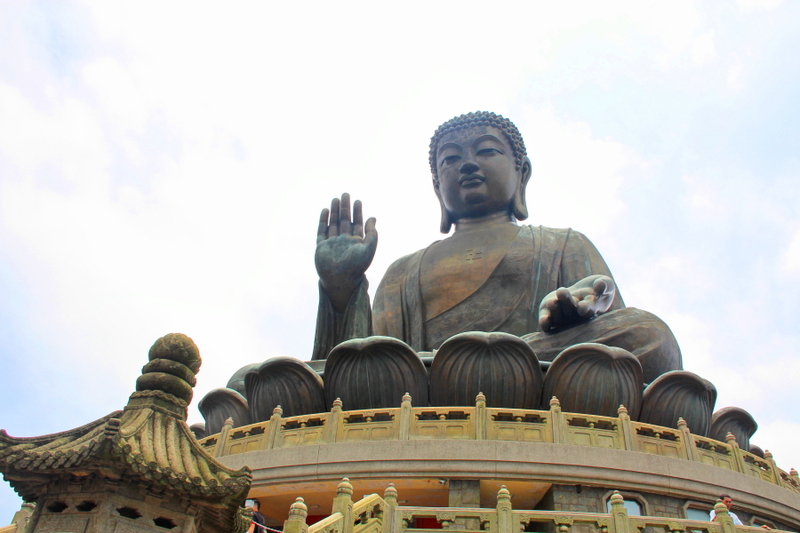 Done with Ngong Ping, we took bus 21 from Ngong Ping bus terminal to Tai O. The bus ride costs $6.3 one-way, and can be paid with Octopus card. The bus schedule is not frequent, refer to bus route and schedule here to plan for your itinerary. 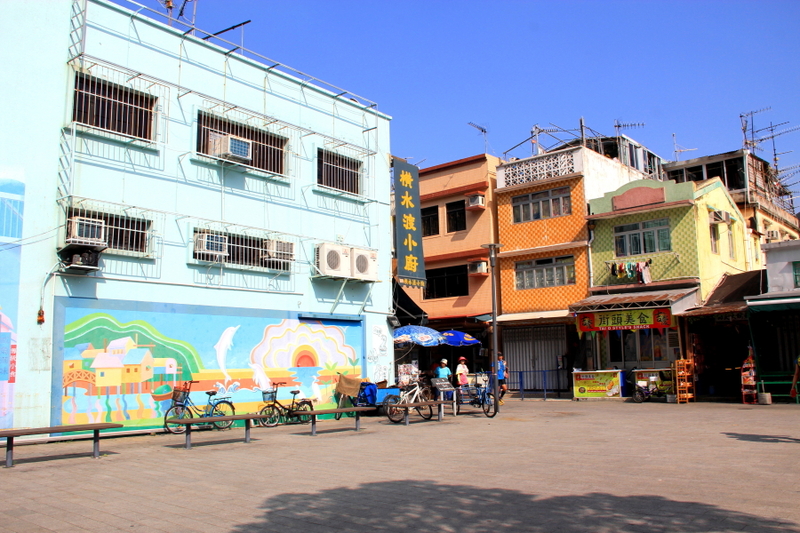 Tai O is a quiet fishing village with many shops along the narrow roads in the so-called market. At the bridge, some women asked us if we wanted a boat ride, but we didn’t have time so we didn’t take it. Maybe next time! We spent only 30-40 mins there because we had to catch the next bus that leaves Tai O before it’s late. 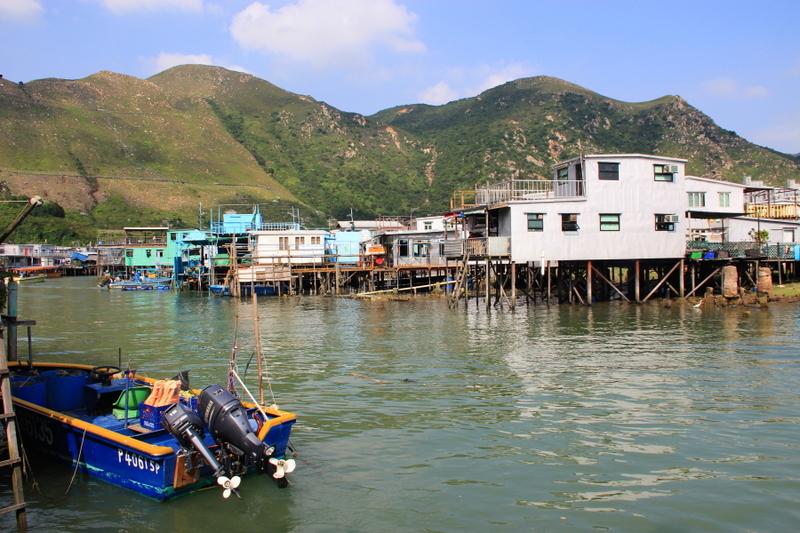 Tai O is definitely worth a visit as a retreat for your eyes. 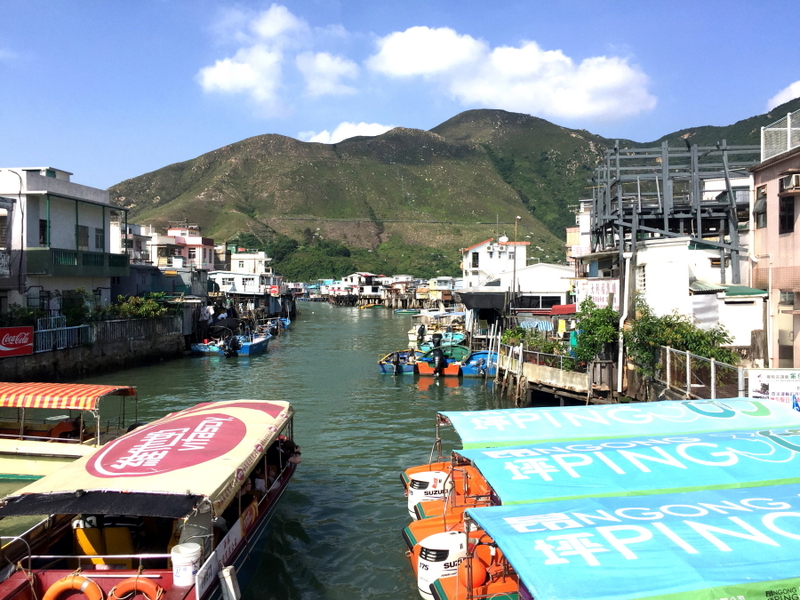 We took bus 21 again from Tai O to Ngong Ping, then cable car from Ngong Ping to Tung Chung, followed by MTR from Tung Chung to Tsim Sha Tsui. 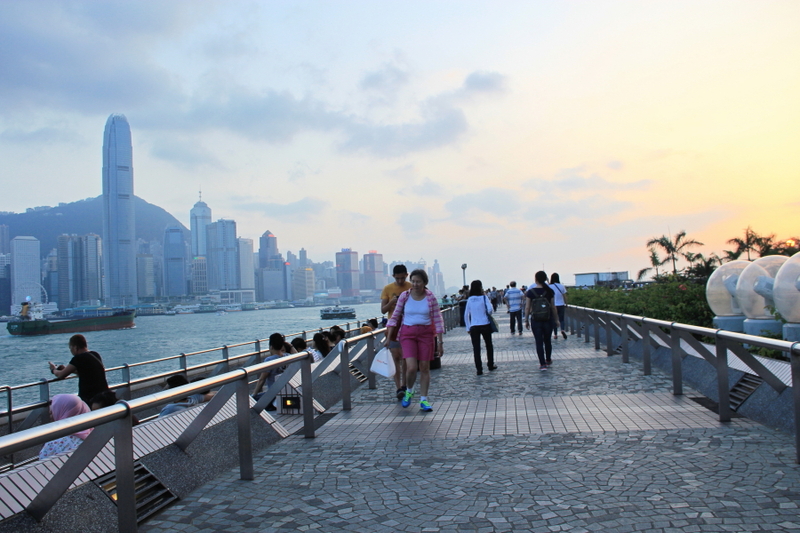 We wanted to visit Avenue of Stars but got lost because there was an ongoing construction around Victoria Harbour, so a lot of walkways were blocked. After few rounds of walking, google mapping, and googling, we finally realised that Avenue of Stars is closed for renovation! How stupid were we, lol! 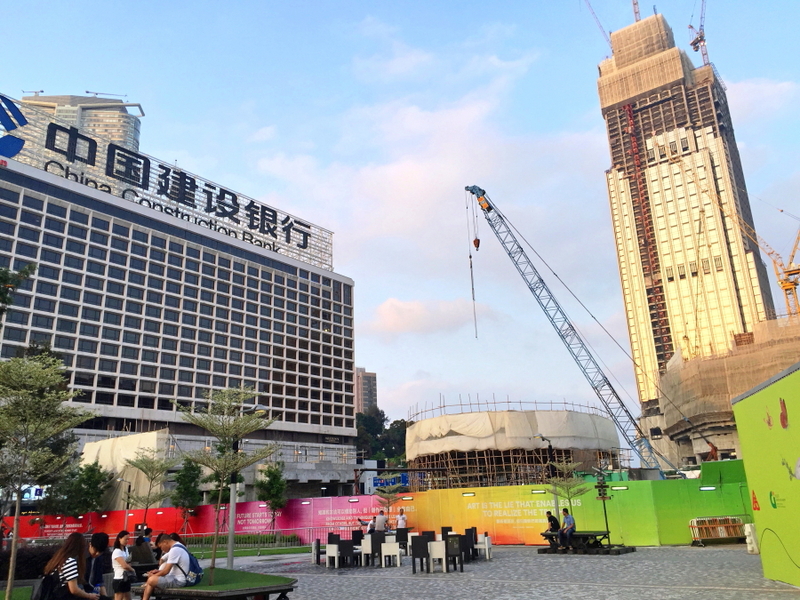 According to Discover Hong Kong, Avenue of Stars in Tsim Sha Tsui is closed for repair and improvement works, which are expected to be completed around the end of 2018. 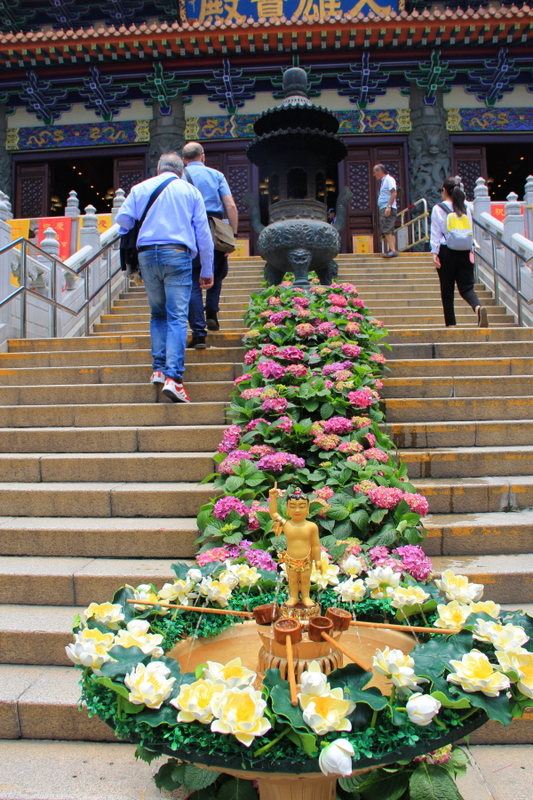 A selection of the Avenue of Stars exhibits is displayed at Garden of Stars and Starry Gallery in the meantime. 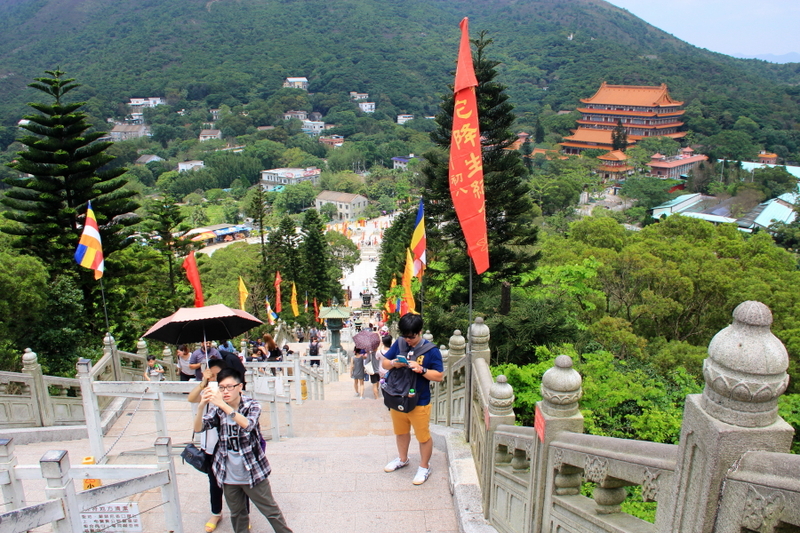 So we hung around the promenade, taking photos and enjoying the breeze. 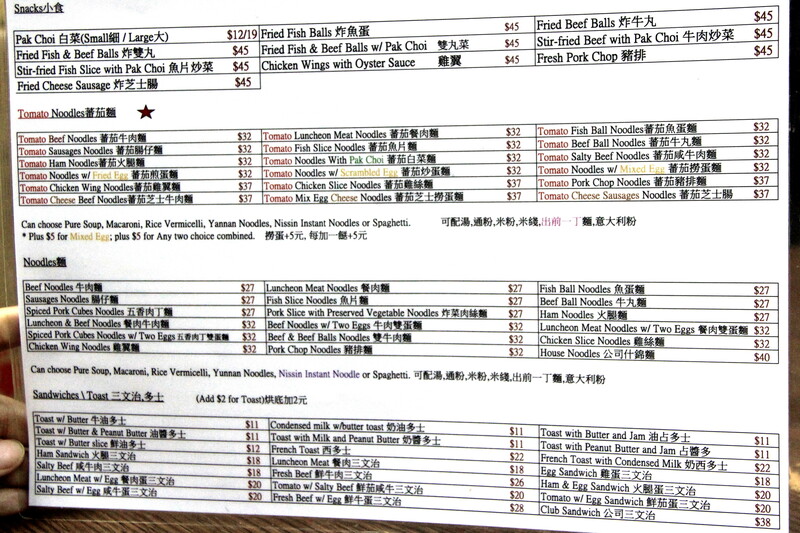 We walked about 1 km from Tsim Sha Tsui promenade to Star Cafe (Address: Shop No. 36, Champagne Court, 16-20 Kimberley Road). 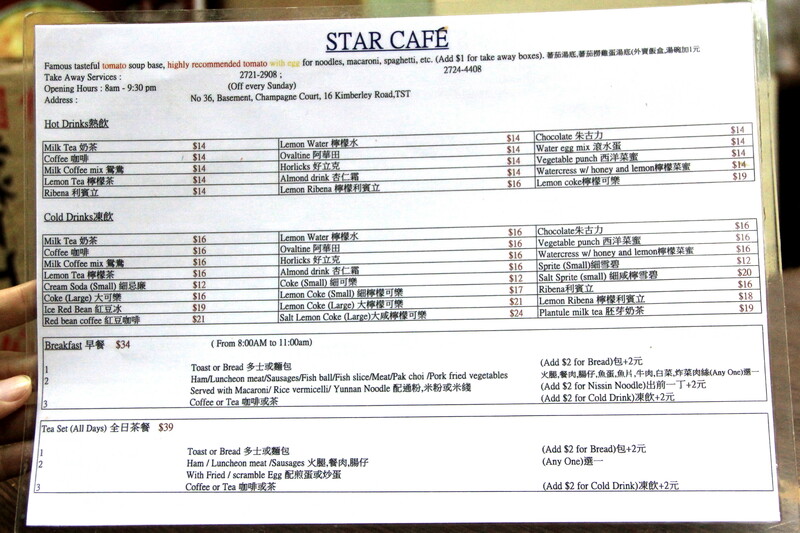 This cafe is not easy to locate, however it receives numerous positive reviews from Singapore bloggers, such as DanielFoodDiary, so I reckon that it’s worth a visit. 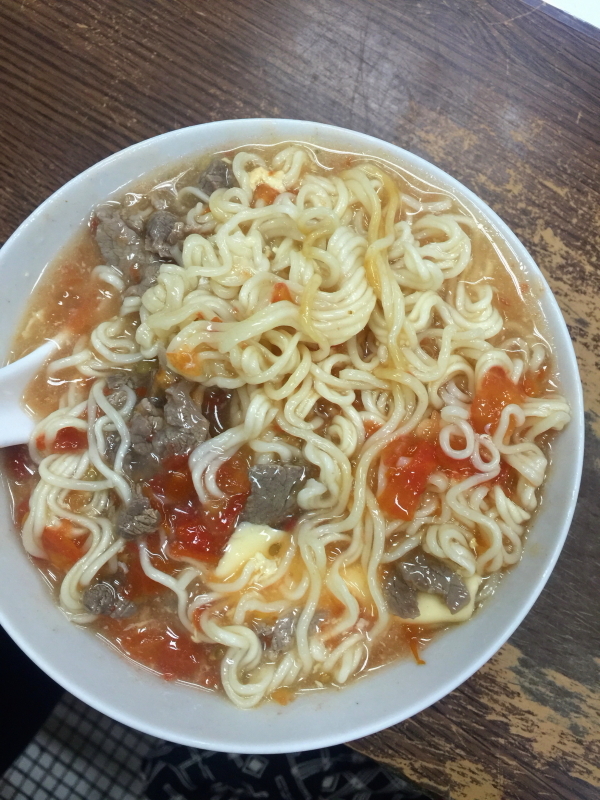 The price is not cheap, $37 for a bowl of tomato cheese beef noodle. My sister and I shared a bowl so that we can eat other things later. Our next food was egg waffle from Mammy Pancake (a Michelin-starred street food). 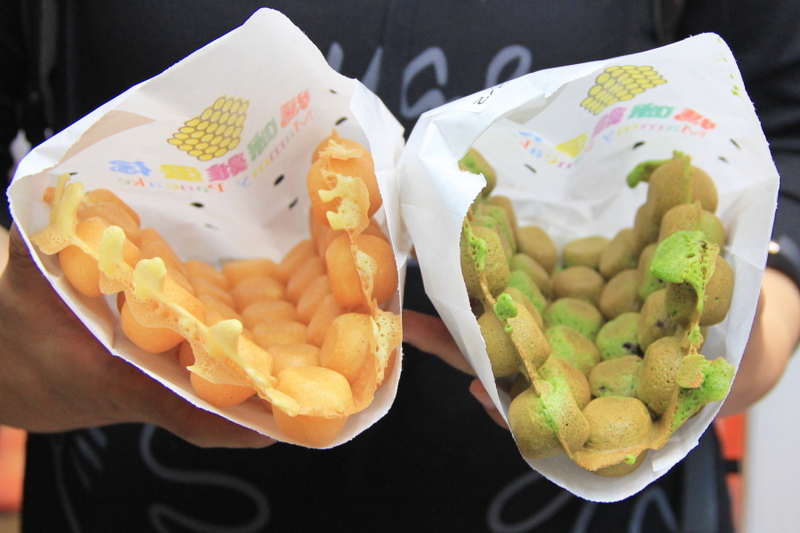 We had an original and a green tea egg waffle. They were great. We ended our night with watching Symphony of Lights at Victoria Harbour. It starts at 8pm daily and lasts about 13 minutes. 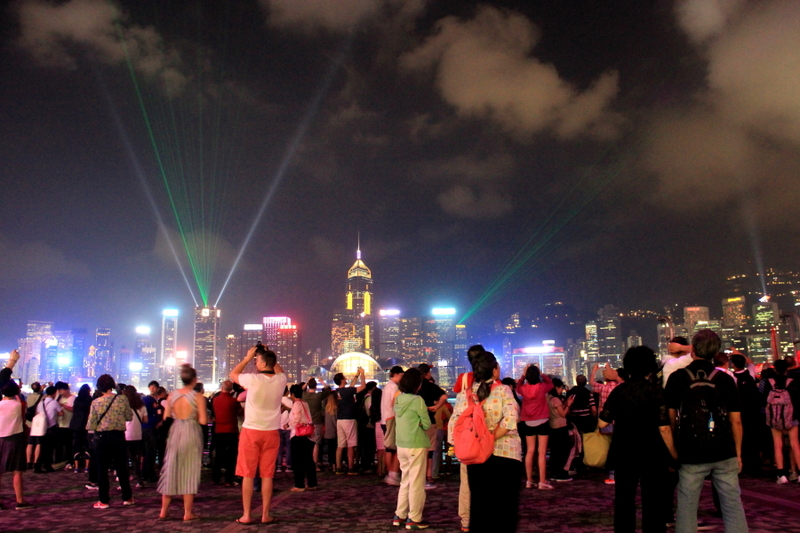 About 40 buildings are lighted up; laser beams and music are present too. The show is free of charge, and it is always jam-packed with visitors. If you want uninterrupted view, consider getting there early and setting up your “spot” before crowd arrives.